Ngalea is located in the far west of the state of South Australia, crossing into Western Australia. It lies west of the Kokatha language, and north of the Mirning language. Ngalea (used by Tindale), Ngaleea (used by Bates), Ngalia (used by AIATSIS & Berndt), Ngaliawongga, Ngalija, Ngaliya, Ngallea, Ngallia, Nangga (men, i.e., circumcised persons), Nanggaranggu, Nanggarangku (lit. 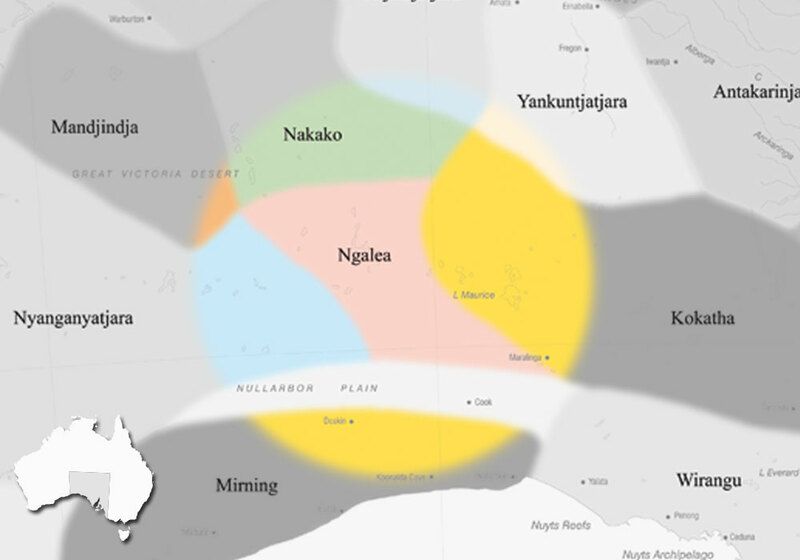 'hostile men,' a term applied by the Pitjantjatjara), Ooldean, Tangara (of eastern tribes; term also used for the Antakirinja), Thala or Thalla, Willoo-rara (means 'west'), Willoorara, Windakan (name applied to language, also to Wirangu). NOTE: Care must be taken when searching for sources or information on Ngalea that you do not confuse it with the similar language language name ‘Ngalia’ from the Northern territory, related to Warlpiri. Tindale distinguishes these clearly, but the AIATSIS catalogue in Canberra, for example, does not.